Cahill set for Fulham move? 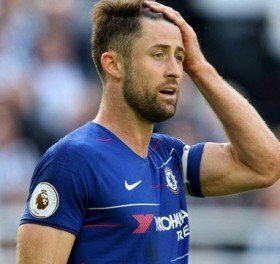 Fulham manager Claudio Ranieri is confident that Gary Cahill will eventually become a Cottagers player, despite uncertainty from the player himself. The Chelsea centre-back will be out of contract in the summer. Cahill, 33, has decided that he will switch clubs as soon as possible after falling out of favour at Stamford Bridge. Fulham are desperately seeking new players as they fight for Premier League survival, with defender Cahill said to be top of the club's transfer wishlist. Ranieri told reporters: "I don’t know, Gary is a very important player and for us it would be fantastic but I don’t know if he wants to come and fight with us." Fulham have conceded 49 goals in 22 games and have so far struggled to keep clean sheets and have been somewhat busy in the transfer market to remedy this situation. Ryan Babel is the first player to have joined Fulham in the January transfer window and Cahill will be seen as an important addition to the club's squad too if a deal can be agreed to bring the former England international to Craven Cottage.